Cultural landscape of the stud farm at Kladruby nad Labem is part of the Tentative list of Czechia in order to qualify for inclusion in the World Heritage List. Though I like nature, horses or animal farms have never been a target of my interest. The reason I visited Kladruby nad Labem this weekend was the nomination of “the Landscape for breeding and training of ceremonial carriage horses at Kladruby nad Labem” as WHS this year. The stud farm is considered as one of the oldest in the world (it celebrates 440 years in 2019!) with uniquely preserved function and structure. The public transport to Kladruby nad Labem is rather infrequent, there is direct bus connection with nearby town Přelouč only during weekdays. So, I travelled from Prague by train to village Řečany nad Labem (quite nice place with interesting Romanesque church), which is on the main train route from Prague in direction East. Fast trains do not stop here and one has to change in Kolín for local trains. From Řečany there is marked blue trail from the railway station to Kladruby along local road - it is ca 3-4 km long and it takes around 3/4 hour of fast walking. As the nominated area is quite large, you enter the core zone soon just after crossing the bridge over river Labe (Elbe). Soon, it was also clearly evident who is at home in this landscape as indicated by all senses - by smell first of all! All roads and pastures in the area are flanked by white fencing, and one can spot Kladruber breed horses quite frequently. The landscape, though flat, is quite picturesque with vast meadows and solitary trees. The area is divided according to its function related to breeding and training of horses into pastures, water sources, woods, stables for mares and stallion, stable for young horses, area for mares with foals, straight alley roads imitating city boulevards for carriage horse training, etc... The main cluster, comprising mares and stallion stables, director office, castle with church and visitors center is located directly in the village Kladruby nad Labem. All buildings are in the empire style and have unified green-white facade. They form a small square or better said courtyard. Entire area was extensively reconstructed in 2014. I visited only Castle and Stables. The castle with adjacent church is rather small and not very spectacular, and it is not a focal point of the ensemble, even though it was founded and visited by Emperors of Austrian monarchy. However, it was interesting to learn something about history related to horses for Austrian emperors. 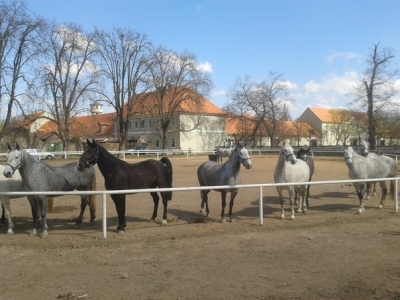 The stud farm was founded because of need of horses of old Spanish and Italian horse breeds for the Court of Habsburg in Vienna and Prague. The Stables are the central and major buildings of the ensemble with main axes in directions to Prague and Vienna. The horses of Kladruber breed are simply beautiful and quite robust. They are used, for example, for purposes of Queen of Denmark. After the tours (each around 1 hour) and lunch, I walk in direction west along ca. 3 km long road (alley) towards another cluster - Františkov, with stables for young horses.The alley is the main axis of the landscape (be aware of a car traffic there), and one can spot number of horse herds all around. The stables of Františkov are built in the same style as the main buildings in Kladruby. During my day trip I have not seen everything important of Kladruby stud farm. Besides walking, cycling would be suitable to explore the area next time. I must say I was surprised by this cultural landscape. It is in a perfect shape after recent reconstruction. It has exactly the same function for several hundreds of years and it is still vital. Its influence goes beyond Czech lands. It is not the tourist trap but all visitors are cordially welcomed by staff and locals. The horses are the main purpose and reason of the landscape. Even though it is not the world class, I think it deserves the WHS status. A stud farm, not handsome guys, but instead horses for breeding. I was really looking forward to something else. I think Czechia has the best variety when it comes to sightseeing in such a small area, from churches and nature, old cities, mines, beer, castles. There are tours in Czech on the hour between 10:00 and 16:00. I'm unclear what the other parts on the menu were but I think you can see certain parts of the place unguided with individual entrance tickets. For non-Czech speakers you are given some text in several European languages. They said the English one is the only one updated to the new tour though. I had to get used to "English text" when doing tours in Czechia anyway so this was no surprise. The stud farm is only reached by car and I doubt they get many foreign tourists before this has a WHS title. The tour goes through a slow pace but I was totally lost trying to use the text. If this was updated to the new tour it didn't match. There was also no indicator where we currently are and the tour guide couldn't speak a single word of English. I tried to find out if we can see the foals and I think the answer was that they are in a separate field with their mothers. So I basically tried to read the entire four page text quickly and tried to match whatever I can with the rooms. 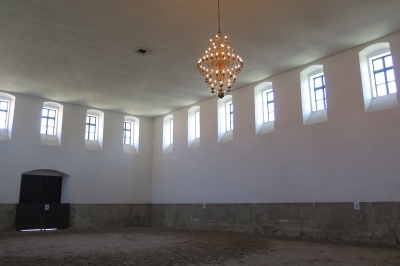 The easiest to spot is the large chandelier that was apparently put up in the stables for a royal visit from the UK (who may actually never ended up coming here). This is also the oddest thing you can see. Chandelier in the stables! Everything else are purely professional stables and shows their routine to raising the horses. The studs look great even for a non-professional like me it is easy to see that. You can pet them in a 10 minute "break" session. Overall the tour is 45 minutes which is enough to see everything of importance. That petting break could have been skipped because nobody asked any question and of course if they could answer my questions I would have used the entire ten minutes for catching up whatever she said in the last 10 halls. It is unfortunate that everything is in Czech. The stud farm has a great history going back hundreds of years but this is all hard to decipher in the plaques. Maybe one is more lucky with a guide that can at least answer some questions. I did learn about how the animals are marked by their lineage which naturally is very important in horse breeding. The stud farm is very popular with Czechs as even the early morning tour was full, with more people queuing for tickets as I left.